A selection of twelve Solarplate etchings from the Toxic Garden (Sweet Pea) series will be on view in the exhibition Printmaking Collaborations: International Masters at The Cape Cod Museum in Dennis, MA, from July 13 to September 17, 2017. 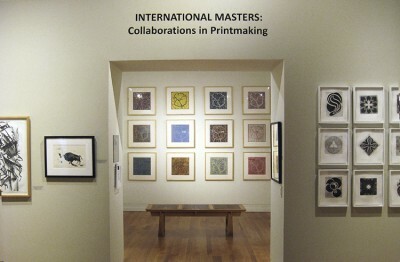 This is an exhibition of lithographs and mixed-media prints created collaboratively with Dan Welden as Master Printer. Laura G. Einstein writes in Journal of the Print World, “…this exhibition tributes a remarkable group of artists who have collaborated with Dan [Welden] at his Sag Harbor printmaking studio Hampton Editions Ltd., founded in 1972, that includes: Lynda Benglis, Willem and Elaine de Kooning, Jimmy Ernst, Dan Flavin, Kurt Vonnegut, Ibram Lassaw, Eric Fischl and Roy Nicholson, among others…. Roy Nicholson’s Toxic Garden, an edition of 19 solarplate monoprints–12 of which are on display in a grid-like suite, create an exquisite tableau that belies the toxic nature of the sweet pea plant in a variety of tones and shades. The masterful experiment in color juxtapositions causes the sweet pea to advance and retreat in a soft pattern akin to the 19th century designs of William Morris suggesting the rose and vine trellises in the Victoria and Albert Museum in London. Nicholson’s Toxic Garden assumes pride of place in an anteroom of this gallery.